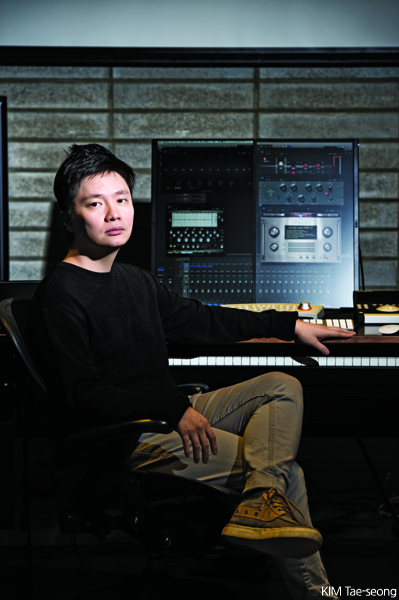 When he first started out, KIM Tae-seong was known as ‘the youngest music director’. Since his debut as a music director in his early 20s, KIM has worked on over 60 films, working tirelessly and releasing an average of five to six pieces a year. He has been in charge of some of the most successful Korean films' soundtracks these past few years and has received several awards for his work but still takes the time to collaborate on small-scale independent film projects. How would you define the role of a soundtrack? In the early stages of my career, I thought all I had to do was find good melodies or music that matched particular scenes. I used to stir up trouble on set because my sole focus was on making music. As I became more recognized for my work on films, getting positive responses and winning prizes, I underwent a change and came to realize that I was a cineaste above all. Creating soundtracks involves a certain amount of strategic planning and directing, that is why I must consider how best to fulfill the director’s wishes as well as the audience’s expectations. I also keep up with current music trends so I tend to pay more attention to how scenes or moments are connected. You’ve worked on an enormous number of films. Do you consider yourself a workaholic? I tend to get nervous when I’m not working and I do not go out very often. Over the years, I've spent most of my time in my studio, unaware that I was burying myself in my work. I don’t know where the past ten years of my life have gone and still feel like I’m in my 20s. For some of my very early works, I had to step in to help fill the shoes of other musicians who’d been fired. In those cases, I would be given a week or two to complete the project and such extreme time constraints put a lot of mental and physical pressure on me. Once, a blood vessel in my neck burst and I had to be hospitalized. Another time, I nearly had a car accident because of a temporary loss of sight I suffered due to overworking. I’m relieved that I don’t have to substitute for others much these days. I’ve also recently taken up yoga in order to build my mental strength. In addition to the major mainstream films you’ve worked on, I notice that there are also some small, independent projects listed in your filmography. Actually, my personal taste lies far from the mainstream movies. I like B-movies or movies from female directors like Sarah Polley and Miranda July. Such preferences have led me to participate in independent film projects or projects with unique topics. In Korea, a great deal of monitoring is done when it comes to large-scale film projects, which frequently results in something very different from what I originally planned to make. When that happens, I cannot help feeling ashamed of myself. Working on an independent film allows me to find relief from all that. The experience of discussing the film with the director directly and intimately becomes a true healing time for me. Films like HAN Gong-ju (2014) and Bedevilled (2010) brought me that experience. In Korea, how is the process of creating a film soundtrack broken down? The process of making a film soundtrack is very complicated. In Hollywood, the composers, music editors, arrangers, orchestrators and sound designers would be working separately but in Korea, the whole process is managed as one big task. The person in charge of music is also responsible for managing the budget and overseeing the project. For example, if you need to record an orchestra and there’s no budget set aside for it, then you will have to bear the expense with your own money, to pay the price of being overly ambitious. The vision I carry is to introduce Hollywood’s advanced soundtrack producing system and adapt it to the Korean market. To that end, my top priority is to ensure that we give credit where credit is due. In reality, in a Korean film, a specific person is singled out to take credit for the music. However, it is highly unlikely that this person was the one composing the score. In most cases, this person would probably be only working as a music editor. This current system that exploits the actual composers and even omits their names in the credits must be fixed. In addition to giving credit where it’s due, time constraints are another urgent matter. Before, I used to have to make music without even watching the film, but that is hardly the case anymore. But time is always tight. For most commercial films, I only get about three weeks after the editing is locked. In order to make it on time, I should read the script and watch rough cuts on set in advance so that I can have music ready to update. With independent films, I have more time to improve the project to completion but the more commercial the film is, the smaller my role becomes. It’s always important to secure enough time to do my best in the post-production stage. I try to watch, hear and experience things as much as I can. Recently, I’ve been greatly inspired by my conversations with several film directors. Fundamentally, I think the most important source of inspiration is sincerity. It’s important to sit down every day and accept to progress little by little. In the end, that kind of hard work helps me find inspiration. The rest is quite secondary.